Life has certainly been interesting since the August frocktails and it's taken me a while to focus on the next event. 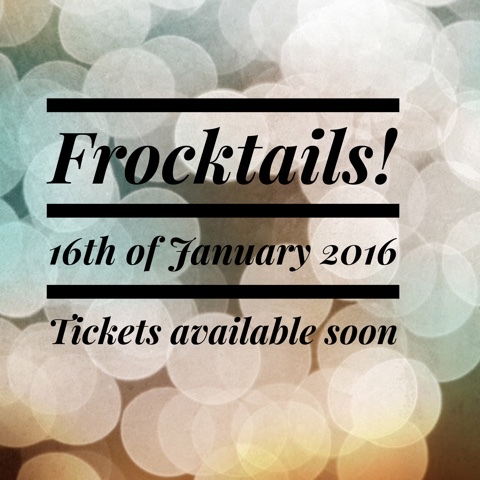 So here are the details for the next Frocktails....You have spoken, and I have listened, so a summer Frocktails it will be! Don't stress if you don't like the heat, a winter event will also be held. We're sticking to the cocktail and canapé format, with a slight bit of tweaking due to the feedback we received eg for the last event, more food and less alcohol. Tickets will be sold through the Sew Squirrel store in a first come, first served basis. There will be plenty of tickets available, and lots of publicity (blog, Instagram) on when tickets will be released. In the coming weeks we will be releasing more information such as FQA, ticketing and maybe I'll finally get around to recapping the August Frocktails! One woman is not an island, so for the 2016 event, I have thankfully received offers of help! My main ladies are Renay and Libby, @windingbobbin and @liblib for all the Instagram lovers out there. We have more helpers, and will be shouting out love and thanks to them as the planning goes on. I will also be sending out all the information on @melbournefrocktails account so you might like to follow it!